He's the 16th inductee into the Academy of Interactive Arts and Sciences Hall of Fame and is honored for, among other things, his work on the Unreal Engine. More casual gamers may not be familiar with Tim Sweeny, though some may have heard of the Unreal Engine. If you're not familiar, the Unreal Engine is a powerful game engine that run behinds a few dozen current generation games like 'Borderlands, ' 'Mirror's Edge,' 'Mass Effect' and more. The Unreal Engine, and its subsequent iterations, has been a major force in the industry in recent years. 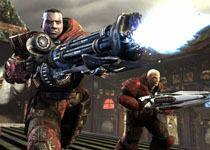 Sweeny is also the founder of Epic Games, the company behind 'Gears of War,' and 'Unreal Tournament.' He also created a game called 'ZZT,' which gained a great deal of popularity back in 1991 for having a powerful in-game editor that allowed fans to let their imaginations run wild. Sweeny's work has earned him a place in the Academy of Interactive Arts and Sciences Hall of Fame. When he's inducted by Epic vice president Mark Rein, Sweeny's name will be added to a list including other industry greats like 'Sim City' creator Will Wright, 'Civilization' maker Sid Meier and Peter Molyneux, the man behind 'Fable,' 'Black & White,' 'Dungeon Keeper' and plenty more.